In second match on Day 26, UP Yoddha drew with Telugu Titans in Vivo Pro Kabaddi League Season VI making it 2 draws in 2 days. UP Yoddha squandered their 8 point lead near the end of the match to draw with the Titans. Abozar Mighani was the sole defender to cause trouble to UP until the end when his corner partner Krushna Madane sprang to get holds. Telugu Titans didn’t get many raid points and thus performed more defensively. Sachin Kumar and Nitesh Kumar were the reason the Titans failed in raids many times by getting 3 and 4 tackle points respectively. Nitesh Kumar was handed the Orange Sleeve for 34 tackle points in Vivo Pro Kabaddi League Season VI as he became the new top defender. UP Yoddha had a disappointing encounter yesterday after they gave away they gave away their lead to Bengal in the dying moments of the match and then drew it while Telugu Titans were starting without their captain Vishal Bhardwaj. Shrikant Jadhav started the match by getting Anil Kumar ushered to the bench in the first raid of the match. Sachin Kumar got a thigh hold on Mohsen Maghsoudlou to take the lead in th 5th minute Do-Or-Die raid for the Titans. The second half saw both teams continue with their previous strategy as Titans got a point recovered by C. Manoj Kumar when he got Rishank Devadiga in a Do-Or-Die raid to make it 19-11 in the 22nd minute only to be neutralised in the very next raid by Shrikant Jadhav and make it 20-11. Nitesh Kumar caused tandem as he got Farhad Milaghardhan with a thigh hold and make it 22-11 in the 24th minute. The 27th minute saw an injury as Abozar Mighani’s dash caused a head injury to Shrikant Jadhav after he was stopped by Mohsen Maghsoudlou with a double ankle hold. The 33rd minute saw Rahul Chaudhari finally get a point in the match and make it 25-17 after 9 raids out of which 5 were unsuccessful. His movements had a different game plan as he got 3 points in the next 5 raids. 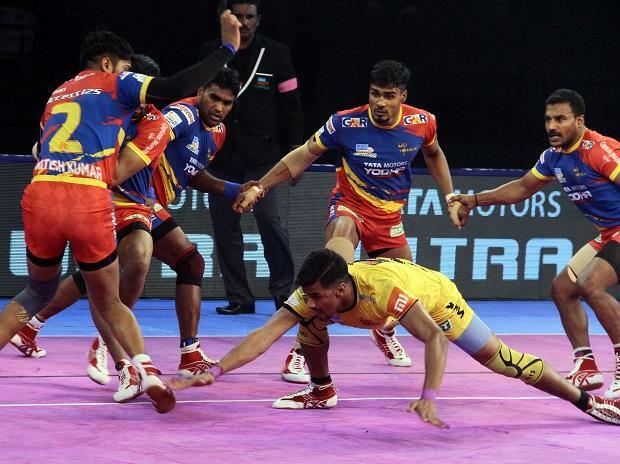 His performance helped Telugu Titans inflict an All Out on UP Yoddha after Krushna Madane got a strong waist hold on Bhanu Pratap in the 36th minute and make it 26-23. These advances towards UP Yoddha’s score by the Titans made UP nervous as they started bottling the match near the end. Mohsen Maghsoudlou’s 39th minute raid saw him get out of the hold of Nitesh Kumar and equalize to 26-26. In the first match on Day 26, Jaipur Pink Panthers registered their second win in Pro Kabaddi League (PKL 2018) season after defeating Haryana Steelers 38-32 on Tuesday. Jaipur's Deepak Hooda collected 12 raid points, while Haryana's Vikas Kandola bagged 10 points. The Anup Kumar-led Jaipur Pink Panthers were desperate for a win as they had entered the match after losing their last four games. The score was tied at 2-2 in the 2nd minute but regular mistakes by Haryana caused Jaipur to take the lead and inflict an All-Out in the 9th minute to make it 11-6 in their favour. However, it looked like Vikas had other plans as he constantly bothered Jaipur's defence with regular bonus and touch points. Haryana made a comeback in the final minutes of the first half as they took a 16-13 lead. They then continued this form and inflicted an All-Out in the last raid of the half to make it 20-18 in their favour. The second half saw Haryana continue with the positivity of the first half and dominate Jaipur as Kuldeep Singh got Anup with an ankle hold to make it 23-18 for Haryana in the 22nd minute. Jaipur stepped up to bring out a response and made the issue 20-23. Jaipur then blocked Haryana from running away with the lead as Nitin Rawal and Mohit Chhillar blocked Vikas near the midline after a failed ankle hold by Young Chang Ko in the 27th minute to make it 22-24. Mohit continued to create problems for the Haryana raiders as he got a strong block on Mayur Shivtarkar to inflict another All-Out as Jaipur extended their lead to 28-25 in the 30th minute. Jaipur then increased the lead slowly to 4 points by the 34th minute as Mohit got a double thigh hold on Monu Goyat and made it 32-28. Nitin continued to cause trouble for Haryana as he blocked Monu from returning to the midline and made it 34-30 for Jaipur. Deepak got his first Super 10 of the season as he got a bonus point in the 38th minute and made the contest 35-30. Jaipur collected three points in the last two minutes, while their opponents could only manage two as the former clinched the issue 38-32.